Royal Vegas Casino is a top-notch award winning online casino and since its inception in 2000 has become a favorite of players. Part of the renowned Fortune Lounge Group, and licensed and regulated by the Malta Gaming Commission, this casino provides players with a safe and secure online gambling experience. Royal Vegas Casino awards players with the best in promotions, player support and a vast array of the most popular online games. All players are treated like VIP’s and feel like they are in a real live Las Vegas casino. Security: Players are guaranteed secure transactions with the most up-to-date encryption technologies. Royal Vegas Casino is accredited with the eCOGRA seal of approval for safe and secure operations and fair outcome of games. 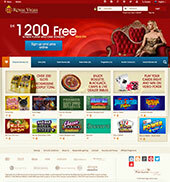 Royal Vegas online casino offers new players a chance to take advantage of the $1,200 welcome bonus. Players who make their first three deposits of at least $20 each will receive a match percentage for each deposit and will be rewarded with a completion bonus. 1st Purchase Bonus, 100% up to €250 FREE! 2nd Purchase Bonus, 25% up to $200 FREE! 3rd Purchase Bonus, 50% up to $750 FREE! Royal Vegas rewards players with special daily, weekly and monthly promotions for mystery gifts, loyalty points, prizes, free tournaments, free spins and fantastic trips and vacation getaways. Players can also take part in the International Casino Games every year where 50 lucky players get to take a luxurious week-long cruise and play for enormous cash prizes. The Fortune Lounge Group is giving away three Las Vegas double prize packages to lucky players. All you need to do is play your favorite Microgaming games at Royal Vegas Casino, and you will earn reward points. For every 100 reward points you earn, you will earn entry into the Las Vegas draw. In addition, each time you fill up the arrow and reach 100%, you will get the chance to scratch for an instant prize! Royal Vegas Casino has an exceptional loyalty rewards program. All players are automatically enrolled and earn loyalty points according to the games played. The more you play, the more points earned that can be turned into cash. New players receive 2,500 free loyal points and players can strive to reach the diamond level and receive even greater benefits. Royal Vegas Casino is powered by industry leader Microgaming software, so players are assured a large variety of the most popular casino games with stunning graphics. Players who prefer table games will find a good selection to include blackjack, roulette, craps and baccarat. There is a massive assortment of slot games to include megaspin slots, fruit slots, 3 reel and video slots. For those players looking for the huge jackpot, take a chance on the progressive jackpot games worth over $2,000,000 and growing. Royal Vegas online casino has also added live tournaments in slots and blackjack where there are buy-in tournaments, scheduled tournaments, freeroll tournaments and Sit’n Go tournaments. Players play against each other for huge prizes. Royal Vegas Casino offers a wide selection of deposit and withdrawal methods. Eco Card, Credit/Debit Cards (Visa, Mastercard and Diners Club), Click2Pay, EntroPay, ClickandBuy, Ukash, EZI Pay, eCheck, INSTADEBIT, Solo and Switch Debit Card, UseMyBank, Direct Bank Transfer, Skrill (Moneybookers), NETeller, UseMyWallet. EcoCard, Click2Pay, EntroPay, EZIPay, Check, Bank Wire / Swift, Solo / Maestro Debit Card, VISA Credit/Debit Cards, Neteller, Skrill (Moneybookers), InstaDebit, UseMyWallet. Royal Vegas Casino has a helpful and friendly support team available 24/7 via live chat. Players can also call on the phone for help from the list of telephone numbers in multiple languages or use email. Royal Vegas Casino received Best Customer Service in 2009.